"Tulasi leaf is very, very dear to Visnu. All Visnu-tattva Deities require profusely Tulasi leaves. Lord Visnu likes garland of Tulasi leaves. Tulsi leaves mixed with sandalwood pulp and placed on the lotus feet of the Lord is the topmost worship. But we must be very careful that Tulasi leaves cannot be placed on the feet of anyone else except Lord Visnu and His different forms. Tulasi leaves cannot be placed even on the lotus feet of Radharani or on the lotus feet of the Spiritual Master. 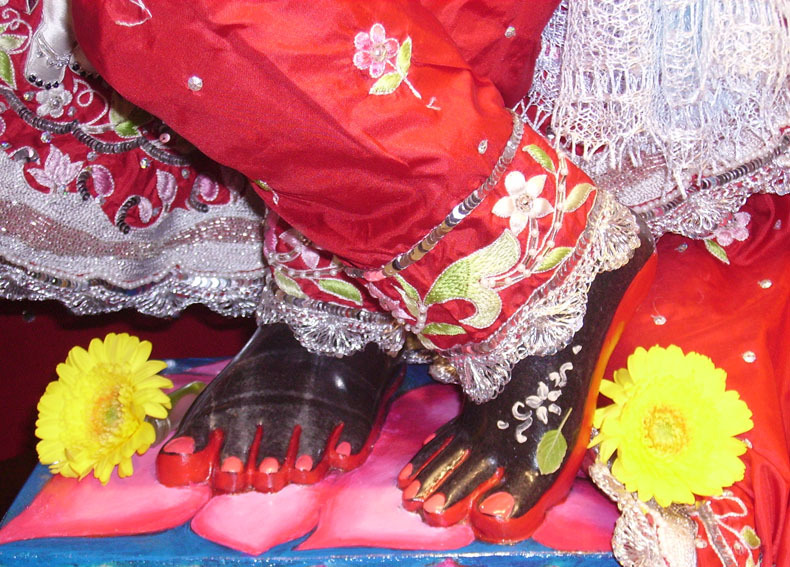 It is entirely reserved for being placed on the lotus feet of Krsna. We can place, however, Tulasi leaves in the hands of Radharani for being placed on the lotus feet of Krsna, as you have seen on the Govinda Album." Photo by Anandamayi devi dasi.